Convert PDF to 6 popular file formats accuratly! Mac PDF to Word : convert PDF to Microsoft Office Word 2003 and 2007 editable document; Mac PDF to EPUB: convert PDF file to Ebook format for better reading; Mac PDF to image: convert PDF document as image file or extract images from PDF document; Mac PDF to text: transfer all kinds of PDF document as text file for secondly editing which is compatible for Windows, UNIX, and Mac; Mac PDF to HTML and SWF: convert PDF files to HTML Web page and SWF file without losing any original layouts, text content and images. The program detects scanned PDF files automatically when adding PDF files. By enabling OCR function, you are able to convert and edit scanned PDF documents with the bulit-in OCR technology in PDFMate PDF Converter Professional. You can extract texts and images from image-based PDF and convert it to editable and selectable Microsoft Ofiice Word files. 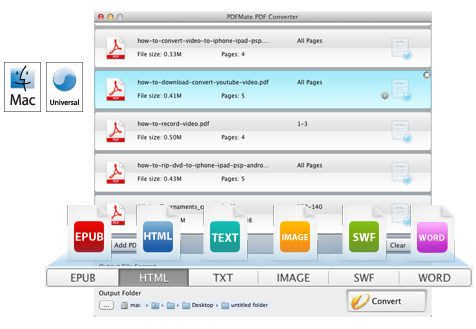 PDFMate PDF Converter for Mac offers the option for users to specify a page or page range of PDF file for conversion. You can either convert the whole page of PDF file or just convert parts of it to the output file format you want. Convenient! PDFMate PDF Converter for Mac is able to convert PDF files in all kinds of languages including English, Japanese, Traditional Chinese, Simplified Chinese, Korean, Latin, Turkish, Greek, German, French, Italian, Portuguese, Spanish, Russian, Polish, Czech, Slovak, Ukrainian, Bulgarian, Croatian, Romanian and etc. Choosing the specific content or ignoring some part of PDF for converting is also supported. You are able to extract only images of the original files when converting PDF to JPG, make new content without images, hyperlinks when converting PDF to EPUB e Books, and choose to ignore images, hyperlinks, etc. to get your own HTML from PDFs. Easy to batch convert PDF files to other formats with super high output quality! When you have lots of PDF files that need to be converted, PDFMate PDF Converter for Mac can be a big help. It allows batch conversion which means it processes at high speed when converting numerous PDF files to other format of files at one time. 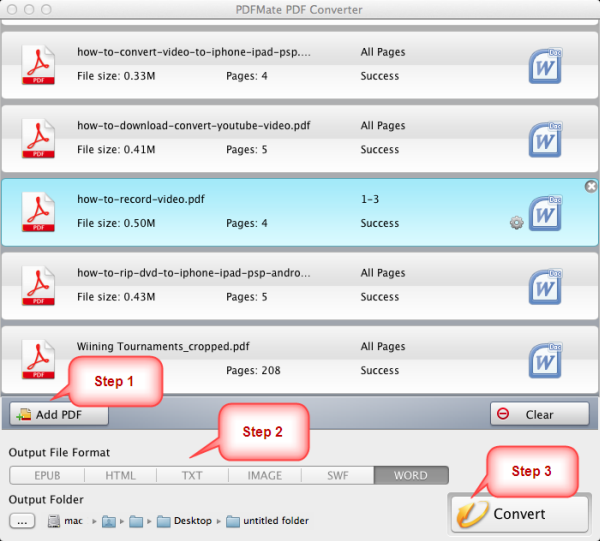 Just by only 3 clicks, you can finish PDF conversion successfully: Add PDF > Choose Output Format > Click Convert. The PDF conversion speed is very quick and fast! The output quality preserves the original layout of text, columns, graphics and etc after conversio. This is an introduction guiding you how to convert PDF files to Word (*.docx), EPUB, Text, Image, HTML and SWF formats with PDFMate PDF Converter for Mac. Click the "Add PDF" button to add the PDF files you want to convert. You can also specify the page to convert. Check the PDF file, and click the button on the middle, there is a window listed to let you choose the page that you want to convert. You can either specific a page to convert or type the page range for conversion. Click the format that you want to output from the output format bar, you can choose from EPUB, HTML, Text, Image, SWF to Word. When you select one output format, the background color of the format would turn dark gray. 1. Choose the output folder to save target file to the folder you like. 2. After choosing the output folder, then click "Convert" button to start conversion. When the conversion is done, you can find your converted file from the output folder you set or just click the output format icon on the main window of Mac PDF Converter to open it..